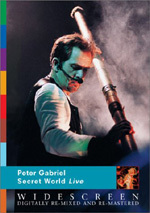 November 2003 saw the release of Peter Gabriel's Growing Up Live DVD, chronicling his world tour, which was celebrated for its spectacular theatrics. Still Growing Up Live & Unwrapped brings Peter Gabriel together again with the award-winning director Hamish Hamilton, capturing his performances in all sorts of smaller and more intimate venues around Europe for the "Live" version of the DVD. For the "Unwrapped" version (Disc 2), which explores the world behind the songs, Anna Gabriel took over the director's chair with the collaboration of Hamish Hamilton. A simpler approach suggested a different set list, and Peter, Hamish, and Anna were determined that this should be filmed in a very different style. It shows Peter Gabriel as many of his fans love to see him, just playing his music. When most acts release concert DVDs, they really have only one tale to tell. Their shows don’t differ a lot across the span of the tour, so additional DVDs would be redundant. For instance, Cream may well put out a DVD for their October 2005 Madison Square Garden shows, but I wouldn’t get it since that setlist was almost identical to what they played in their May 2005 Royal Albert Hall concerts. The DVD’s set includes seven tracks that fell into that category: “Come Talk to Me”, “San Jacinto”, “White Ashes”, “The Tower That Ate People”, “Burn You Up, Burn You Down”, “Games Without Frontiers” and “Biko”. “The Feeling Begins” didn’t appear on the earlier Growing Up Live DVD either, but the remaining five songs – “Red Rain”, “Secret World”, “Digging In the Dirt”, “Solsbury Hill” and “Sledgehammer” – all repeat from the prior release. This show offers different staging than that arena extravaganza, though. The DVD presents numbers from seven different venues across Europe. It doesn’t cut from one place to another between songs - it often does so during tunes. The audio never changes, so unlike a feature on the recent Pixies Sell Out DVD, we don’t encounter any jarring sound changes. The visual shifts blend fairly well; they’re occasionally distracting as Pete immediately goes from one spot on stage to another, but they’re usually smooth. Although this show is more subdued than the 2002-03 Growing Up concerts, don’t assume that means it lacks visual panache. I don’t think Gabriel could ever put on a simple, straightforward stage production, and God bless him for that. Still features an elaborate and evocative light show along with Pete’s usual prancing and shenanigans. Heck, the man dances onstage in a suit of lights during “Sledgehammer”. For “Games Without Frontiers”, he and daughter/backup singer Melanie totter around the stage on Segways. I don’t really get the point, but at least it’s an interesting visual. While director Hamish Hamilton kept the gimmicks to a minimum on the prior Up DVD, he goes a little wilder here. We get more quick-cutting and odd visuals during Still. For instance, “White Ashes” features a lot of intentionally blurry shots, and “Tower” uses a jerky-cam that swirls around the stage. The methods don’t overwhelm, but they seem unnecessary. Even though he looks like a monk these days, Pete is still a vivid, magnetic stage performer, and he doesn’t need silly editing and camera techniques to make him interesting to watch. Despite that, Still Growing Up offers a nice companion to the earlier Growing Up DVD. It offers a smattering of songs not found on the prior disc and features performances in interesting new settings. Up is the better release of the two, but Still complements it well. Still Growing Up – Live and Unwrapped appears in an aspect ratio of approximately 1.78:1 on this single-sided, double-layered DVD; the image has been enhanced for 16X9 televisions. Some stylistic choices occurred that marred the proceedings, but the show usually looked quite good. Sharpness mostly seemed solid. Occasionally, wide shots came across as a little soft and ill defined. However, those examples appeared infrequently and did little to distract from the rest of the presentation, which mainly looked concise and detailed. Some intentionally out of focus elements appeared as well, but I didn’t regard those as “flaws”. I noticed no issues with jagged edges or moiré effects, and I also detected no signs of edge enhancement. Source defects looked absent most of the time. Sometimes the show used lower resolution equipment that added artifacts and blockiness, but those were rare instances. Since Pete and band dressed totally in black, the majority of the colors came from lighting. Those hues looked well developed and accurate. Some lighting was a little dense, but not terribly so. Blacks were deep and dense, while low-light shots came across as clear and appropriately visible. Still had some minor concerns and didn’t look as good as Growing Up, but it remained consistently satisfying. As was the case with its predecessor, Still Growing Up featured both Dolby Digital 5.1 and DTS 5.1 soundtracks. These mixes were so much like the tracks for Growing Up that my comments won’t change much. Each mix worked well, but I definitely gave the nod to the DTS one as the superior version. I’ll discuss it first and then relate why I preferred it to the Dolby edition. The soundfield seemed smooth and well rendered. Vocals stayed nicely centered as the music swirled around Pete. Instruments spread cleanly across the front and seemed appropriately placed. It was easy to isolate each one, as they seemed nicely delineated. Surround usage mostly leaned toward crowd noise and general reinforcement of the music, though it seemed more active in that regard than most concert programs. The mix occasionally added unique elements in the back, though, and could present some interesting developments. The surrounds accurately and solidly supported the front but didn’t cause distractions. Not only did the track present a very well defined soundfield, but also it offered stellar audio quality. Vocals consistently sounded warm and natural. Happily, the producers resisted the urge to give the singing a thin reverberation to simulate the arena experience, so the vocals seemed distinctive and detailed. All instruments came across as accurate and concise. Drums punched crisply, while guitars chimed nicely. Bass response seemed absolutely stellar. That aspect of the track presented rich and lush low-end, and that depth gave Still a great sense of life. I don’t issue many “A+” grades for audio, but Still sounded so damned good that I couldn’t think of any reason not to do so. While more than serviceable, the Dolby Digital 5.1 track suffered moderately by comparison to the amazing DTS mix. Part of the drop came from the bass response. The Dolby version produced some very nice low-end, but it lacked the richness and vivacity of the DTS edition’s bass. Other elements like drums and vocals sounded slightly thinner as well, and the soundfield didn’t blend quite as well. Don’t take these criticisms to an extreme, as the differences weren’t huge. Nonetheless, they existed and made the DTS version easily the one to choose. One gripe some may have with the audio: I believe a lot of non-live material appeared here. By that I mean I got the distinct impression many vocals – and probably instrumentation as well – were re-recorded later. Heck, “White Ashes” virtually sounded like a studio session. I could be wrong about this, but I simply didn’t get a “live feel” from the audio much of the time. It sure sounded great, but I question how much actually came from a stage. With a second disc in tow, we get a good allotment of supplements here. A couple reside on DVD One, though. There we find two Bonus Tracks. These include a 2004 performance of “In Your Eyes” and a 1987 take on “No Self Control”. I’m not clear why “Eyes” wasn’t part of the main program since it appears to come from the same set of shows. In any case, the 11-minute and 45-second tune offers a good performance and makes a nice addition to the set. Note that it includes the same audio options as the primary show, and it also comes with anamorphic video, though its visuals looks a bit rougher than the rest of the set. As for “No Self Control”, it stands as a more logical “extra” given that it doesn’t connect to the 2004 tour at all. Also presented with the three audio options of the main program, it combines live shots with images of the band on the road. I’d prefer more of the former than the latter, and this clip also makes me wonder why we’ve not gotten a DVD release of POV, the program from which this six-minute clip emanates. Moving to the second disc, the main component comes from a documentary entitled Still Growing Up Unwrapped. Directed by Pete’s daughter Anna, this one-hour, 16-minute and 45-second program shows live snippets, the band on the road, and comments. We hear from Pete, his band, and some fans. Pete dominates, though, as he chats about playing live, making music, his life, and his experiences. “Unwrapped” could have turned into a nice glimpse of all those topics. Unfortunately, it’s just a glorified concert video. It does little more than package the “Still Growing Up” show with occasional soundbites. We learn a few good notes such as how Pete’s time opening for Frank Zappa affected him, but since we already have “Still Growing Up” on its own, this piece feels redundant most of the time. We also get some additional songs. Filmed before the start of the 2002 tour, we find studio performances of “Darkness” (six minutes, 17 seconds), “No Way Out” (7:28) and “Growing Up” (7:21). All are interesting to see given the simple surroundings. “Out” is particularly useful since it doesn’t appear live here or on the prior live DVD. We also see BBC performances from Later… With Jools Holland in May 2000. These include “Downside Up” (6:13) and “Father/Son” (4:15). “Up” is intriguing in that Pete takes a backseat and doesn’t do the lead vocals. Instead, Paul Buchanan handles his part, while Elizabeth Frazer does the female vocals done by Melanie live. Both tunes come from the Ovo project, and I believe those two reprise their roles from it. “Father/Son” goes back to Pete on vocals. Both are cool additions to the disc. Lastly, the package presents a 12-page booklet. It features an introductory note from Pete, credits and photos. It doesn’t bring a ton to the table, but it makes a decent complement. 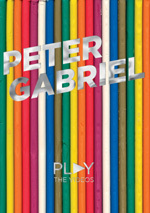 A terrific live performer, Peter Gabriel reminds us of those talents in Still Growing Up – Live and Unwrapped. Via a scaled-down – for him, at least – production, Gabriel provides a solid sample of old and new songs, all performed well. The DVD offers very good picture and excellent audio. The extras present a few interesting performances, but the documentary comes as a disappointment. View Still as a complement to the 2003 Growing Up Live DVD. If you only want to own one, I’d recommend the latter. 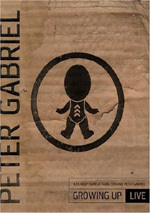 Still is a nice addition for big fans who like to see all sides of Peter Gabriel.